Danbury High honored seven athletes who are signed to collegiate programs on Wednesday. 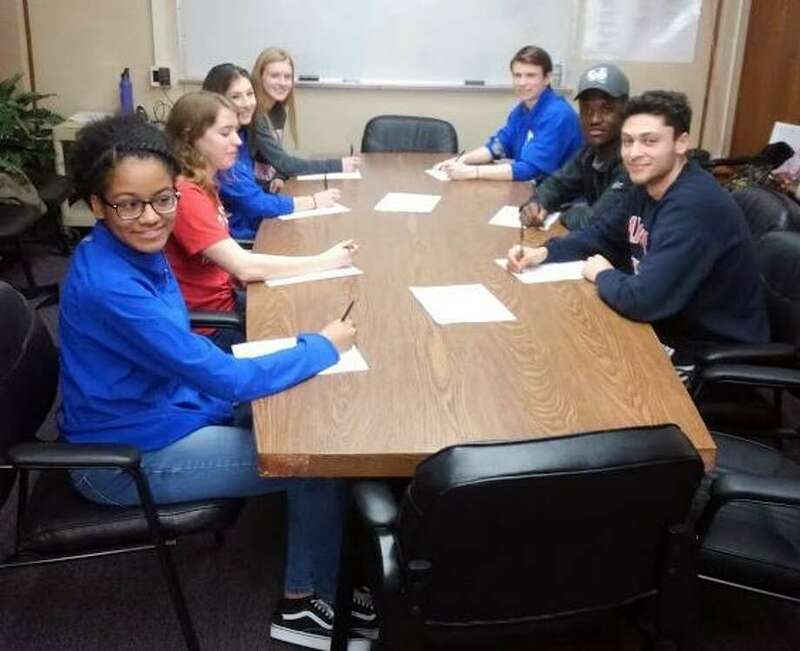 Signing day at Danbury High School had a track and field feeling to it, and by no accident. Boasting the top program in the state has a way of producing quality athletes, and that was the case again this year as several were honored on National Signing Day on Wednesday. Lauren Moore (Navy), Cassandra Sturdevant (Sacred Heart), Natalee Seipio (Southern Connecticut) and Malcolm Going (American) will run in college. Seven athletes total were honored as Malik Thomas — another track standout — will play football at Central Connecticut and a pair of swimmers — Grace Lange (Boston University) and James Lukasik (Hartwick) also signed. Going has been nationally ranked in the 600 and 800 during his time with the Hatters, winning the 600 at New Englands last winter. Thomas has developed as both a sprinter and running back for Danbury over the past year. Moore is following in her family’s footsteps to the service academies. The defending 1,600-meter champion at last June’s outdoor New England championships plans on studying oceanography and is considering serving in surface warfare. Sturdevant has a host of medals to her name over the past two seasons, shining at the middle-distance level. She was a key component to the Hatters winning their first FCIAC, Class LL and State Open cross country titles in program history. Seipio is a sprint specialist for the Hatters; she owns one of the FCIACs top 300-meter times. “It’s really nice; to a certain degree it’s self-actualizing because you want them to see the bigger picture, to see there is a next level, and to just try and be their best and see where that gets them,” Hatters girls coach Nick Fraticelli said. Lange swims for the Wilton Wahoos club team and has swam at YMCA Nationals in the past year. She finished third at the Class LL championships her senior year in the 500 freestyle. Lukasick swims for New Fairfield Aquaflyers and swims in sprints for the Hatters.